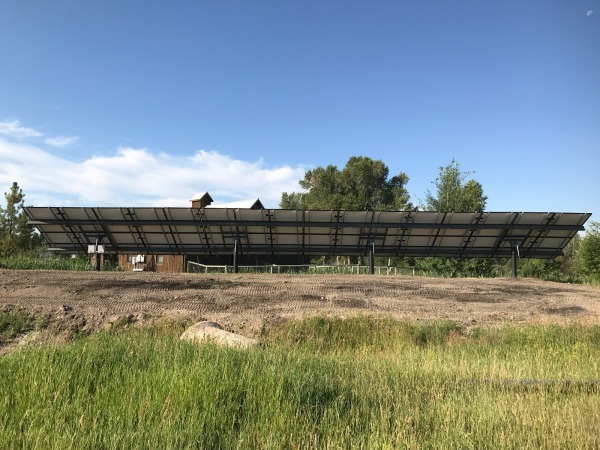 When OnSite Energy was first called out to assess this property for a solar array, the owner expressed that the roof was off limits and the only eligible location for a ground-mount solar array was on a narrow strip of land between an irrigation canal and their northern property boundary. 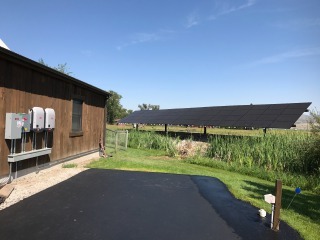 After assessing the annual energy consumption of the owner's home, the shop building, and the irrigation system there, it was clear that a sizable solar system was required to completely offset their electrical usage. In addition to the usual custom design of the mechanical and electrical aspects of this system, this project took an exceptional amount of civil engineering to execute the job. 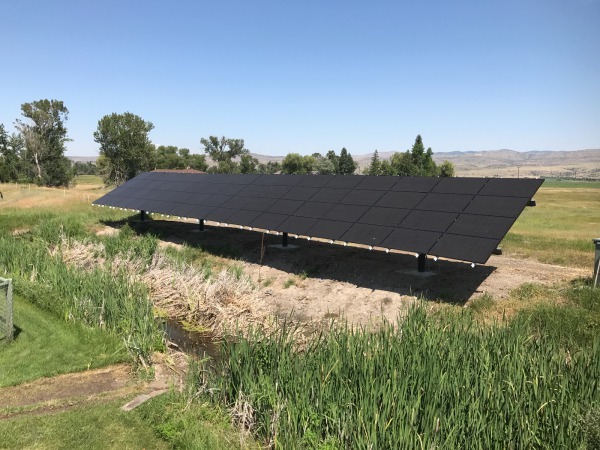 Consisting of sixty-four LG Electronics 305-Watt solar modules installed in one even plane across four 8" steel posts, the total solar array rating is 19.2 kiloWatts (kW). The system size was selected to offset 100% of the owner's annual energy usage, and the module type, quantity, and layout was selected for optimal solar exposure and array aesthetics. 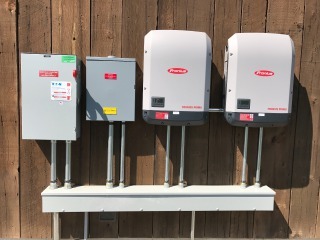 We installed two Fronius Primo 10 kW inverters to convert the array's power from direct current (DC) power to usable alternating current (AC) power for the property. Fronius inverters are over 97% efficient, and have a reputation as one of the most reliable inverter brands in the industry. Each inverter manages the power output of exactly half of the solar array, and feeds the home's electrical service in a single, paralleled output circuit. MT Solar's top-of-post rack system was selected for the unique attributes of having the ability to install the array at waist level, wire it up at 3/4 height, and then hoist it into it's final position with chain-fall hoists that sit atop the posts. The result is a fast, easy, installation with minimal time working on ladders, and a clean, aesthetic array that maximizes the square footage area where it is positioned. The owner has the ability to adjust the tilt angle of the solar array seasonally to maximize it's angle of incidence to the sun's changing elevation angles throughout the year. With nearly 20% efficient solar modules, 97 % efficient inverters, and an adjustable solar array, the owners will be able to produce as much solar energy as possible given the parameters of their site! The main challenge of this project was siting the solar array. The array is positioned on a small area of an old railroad grade, between their property line to the north, irrigation canal on the south, a utility transformer to the east, and their neighbor's electrical service pedestal to the west. They literally could not have fit more solar panels in this space, or moved the array 2' in either direction. 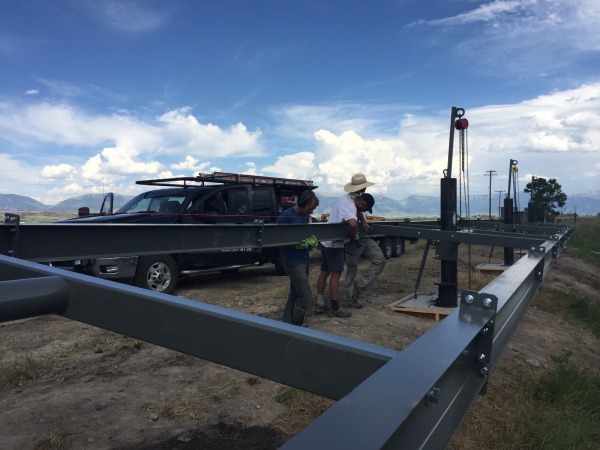 Crew members assembling the steel I-Beam structure. Building the array at waist level before hoisting is the way to go! The MT Solar rack system viewed from behind. Fronius Primo 10 kW inverters and electrical distribution equipment.